3-ton centre post car lift. Homepage. This page: C.C. 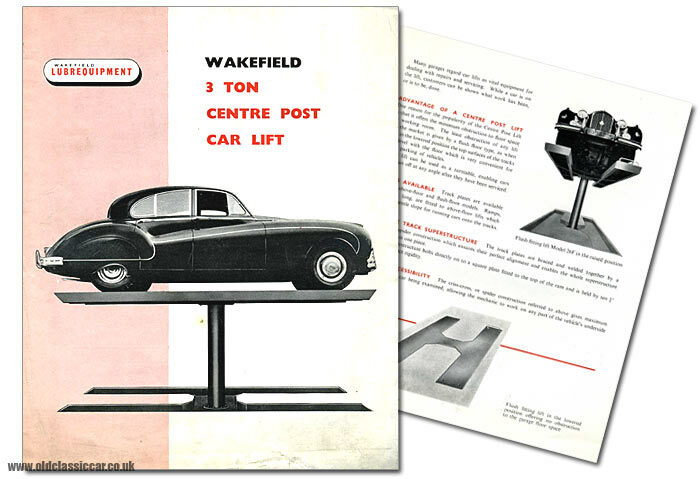 Wakefield & Co. Ltd.'s centre-post car lift from the 1950s, suitable for cars weighing upto 3 tons. Similar in appearance to the Sky-Hi car lift of the 1930s, and also rated at 3 tons, the Wakefield 3-ton Centre Post Car Lift was designed for commercial rather than private garages. The cover of this original leaflet shows the lift in action, with a mighty Jaguar saloon perched upon it. Although airbrushed somewhat, the Jaguar looks to be a Mk7, or more likely a Mk7M. An illustration within the leaflet shows the car from the front - same Jaguar? This one shows the Mk7-style grille, but with circular grilles beneath the headlamps, and Lucas auxiliary lamps mounted just outboard of them, both Mk7M styling cues. The car's registration - RXU 915 - if genuine - suggests that the car was registered in or around London some time after August 1955, by which time the Mk7M had taken over from the Mk7. Advantages of a centre post life included the fact that less floorspace was taken up when compared to a four-poster, and that once lowered the ramps on the flush-floor type were very unobtrusive. The lift was also able to rotate, enabling the cars being worked on to be driven off at whatever angle you chose. Optional cross-members and jacks could be purchased separately, allowing the mechanic to lift the car and raise it off its wheels while on the ramp, a much easier alternative to grovelling around underneath the car on the workshop floor with a bottle jack. C.C. Wakefield and Co. Limited, of Castrol House, were the suppliers, a firm perhaps better known for its range of vehicle lubricants. Although un-dated, a code on the rear cover suggests a printing date of October 1959 for this leaflet.